LSAT (US, Canada, Australia) The Law School Admission Test (LSAT) is a half-day standardized test administered four times each year at designated testing centers throughout the world. LSAT exam is administered by the Law School Admission Council (LSAC) for prospective law school candidates. LSAT exam is designed to assess reading comprehension, logical, and verbal reasoning proficiencies. If you want to get a law school admission, LSAT test is an integral part of the process in the United States, Canada (common law programs only), the University Of Melbourne, Australia and a growing number of other countries. We provide you with the best in class LSAT mobile apps for your preparation. The Best Top 5 LSAT preparation mobile app will help you to increase your LSAT Scores and also get you admitted to your dream university. As you know an applicant cannot take the LSAT more than three times within a two-year period, so make sure you put all your efforts and also use the Useful LSAT Preparation mobile apps for best of your use. LSAT Prep, LSAT Flashcards App has been released by Magoosh Education. The app description in Google Play read as "Get ready for the Law School Admissions Test (LSAT) with this research-based LSAT Flashcards App. It will help you study for the LSAT by quizzing you on analytical thinking and helping you to master the basics so that you can answer LSAT questions quickly and confidently"
This LSAT practice app includes LSAT flashcards that follow an algorithm based on the Spaced Repetition Technique. The Spaced Repetition Technique comes from academic research, which shows that memories are formed by repeated exposure to new information at different intervals. When you practice with these LSAT flashcards, you’ll notice that flashcards are tagged as "mastered", "reviewing" or "learning". Cards that you are "learning" will appear most frequently, until you master them, and then they will appear less frequently so that you can continue to review the LSAT flashcards. LSAT Prep, LSAT Flashcards has been installed between 5,000 - 10,000 times by users at the time of this review and has an average rating of 4 in Google apps store. LSAT Prep, LSAT Flashcards app has been reviewed by 9 Users and 5 users have rated 5 stars. LSAT Prep, LSAT Flashcards app size varies from device to device and can be installed on any Android device running version 2.1 and up. LSAT practice test App has been released by Loxo Apps Education. The app description in Google Play read as "LSAT practice test is a great way to help you prepare for LSAT exam. We offer studying tools for any subjects, purpose learning materials for everyone from everywhere. Instead of the traditional learning with books, the brain is also challenged via our several learning modes: Study, Slide show, Matching, Memorize, Quiz to make the process for you study more exciting and fun." LSAT practice test has been installed between 1,000 - 5,000 times by users at the time of this review and has an average rating of 4.5 in Google apps store. LSAT practice test app has been reviewed by 36 Users and 25 users have rated 5 stars. LSAT practice test app size varies from device to device and can be installed on any Android device running version 4.4 and up. LSATMax LSAT Prep App has been released by TestMax Education. The app description in Google Play read as "The highest-ranked app for LSAT prep. Raise your score with LSATMax. Guaranteed and join 150,000+ students who raised their score and were accepted into their top law school choices." LEARN FROM INSTRUCTORS IN THE TOP 1% - Not only have all our instructors taken the LSAT, but they're also required to score in the 99th percentile. STUDY REAL LSAT QUESTIONS - Gain experience by studying 7500+ real, licensed questions from previous LSATs (not made-up questions, like other prep courses). DITCH THE CLASSROOM - Developed by Harvard Law School alumni, LSATMax helps you learn on-the-go (no Internet required) and at your pace. BUILD TEST-TAKING CONFIDENCE - Step by step, our instructors walk you through 70+ hours of whiteboard explanations, detailing every LSAT concept and question type you'll encounter. Detailed analytics identify your areas of strength and weakness. DON’T LET THE PRICE FOOL YOU - Get lifetime access, starting at just $399. Monthly subscriptions from $50. LSATMax LSAT Prep has been installed between 10,000 - 50,000 times by users at the time of this review and has an average rating of 4.1 in Google apps store. LSATMax LSAT Prep app has been reviewed by 94 Users and 61 users have rated 5 stars. LSATMax LSAT Prep app size varies from device to device and can be installed on any Android device running version 4.1 and up. LSAT: Practice,Prep,Flashcards App has been released by Varsity Tutors LLC Education. The app description in Google Play read as "The first step toward getting into your dream law school is earning a high score on the Law School Admission Test. It takes work to become a competitive applicant by boosting your LSAT score, and the free Varsity Tutors LSAT Prep app for Android-powered smartphones and tablets can help you do so"
Utilize the app’s practice tests for LSAT Reading Comprehension (the exam’s largest section) for science, law, social science, and humanities to work your way toward a perfect 180. Plus, save your scores, track your progress, and identify testing weaknesses using the app’s handy Tests Taken feature. Varsity Tutors’ Android LSAT Prep app is designed to work best for the busy student. Adding this app to your study toolkit can coach your test-taking skills in each of the LSAT’S sections: Logical Reasoning, Analytical Reasoning, Reading Comprehension, and Writing. LSAT: Practice,Prep,Flashcards has been installed between 1,000 - 5,000 times by users at the time of this review and has an average rating of 4 in Google apps store. LSAT: Practice,Prep,Flashcards app has been reviewed by 11 Users and 6 users have rated 5 stars. LSAT: Practice,Prep,Flashcards app size varies from device to device and can be installed on any Android device running version 4.1 and up. LSAT 2017 Exam Prep App has been released by Youth4work Education. 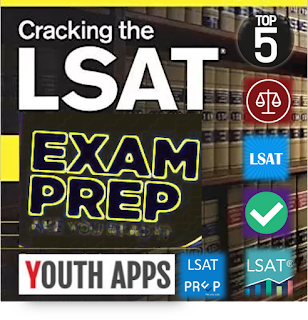 The app description in Google Play read as "LSAT 2017 Exam Prep App is powered by Youth4work.com (a leading online portal for Competitive Examination Preparation & Career Development). This app is for all Law School Admission Test applicants who aspire to get admission is law schools across USA, Canada and Australia. The app offers online tests on topics as per the syllabus of LSAT to provide the aspirants sufficient questions for practice before they face the actual test"
1. Complete Mock Test, covering all sections. 2. Separate Section wise and Topic wise tests. 3. Reports to reflect accuracy and speed. 4. Discussion Forums to interact with other Aspirants. 5. Review all attempted questions. LSAT 2017 Exam Prep has been installed between 100 - 500 times by users at the time of this review and has an average rating of 1 in Google apps store. LSAT 2017 Exam Prep app has been reviewed by 1 Users and 0 users have rated 5 stars. LSAT 2017 Exam Prep app size varies from device to device and can be installed on any Android device running version 4.1 and up. So is there a final verdict, no I don’t think so because it would be difficult for us to provide you with the perfect LSAT mobile app for your preparation. We have already narrow down to Best 5 LSAT Preparation mobile app from 100+ apps in the market, so try using all these apps and see what fits your purpose. From a data and user acceptance point of view, "LSATMax LSAT Prep App" seems to be the most preferred one. All the best for getting higher scores in LSAT and see you soon as a Law Graduate.